The Paris-based Almaviva tile studio manufactures custom-made medieval tiles: floorings, earthenware and glazed tiles, Spanish socarrats, blue and white tin-glazed tiles, etc. Our tiles are manufactured by hand with traditional craft techniques; therefore, they look like old tiles. 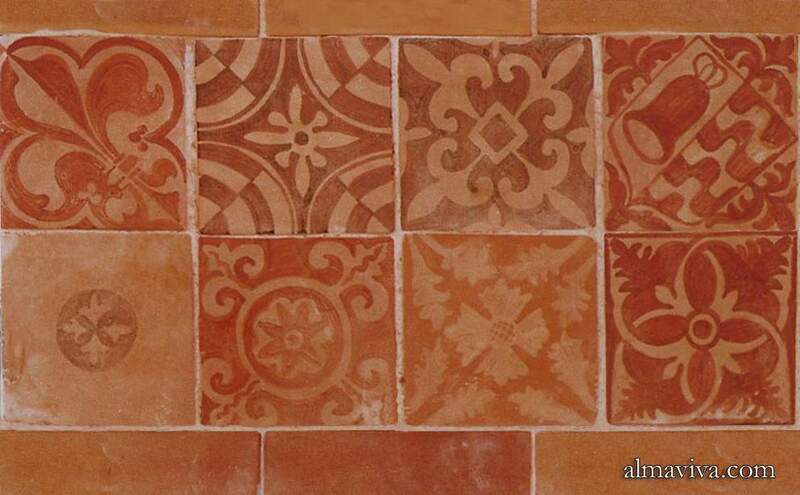 During the Middle Ages, the floors of the Romanic churches began to be covered with terracotta tiles. They were often assembled like mosaics, with tiles of different shapes. 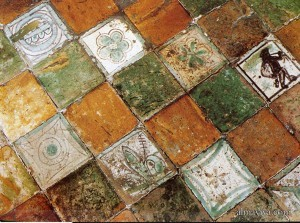 In the 12 th century, these floor tiles started to be covered with a transparent lead glaze; the usual colours were yellow, brown, and green. Further on, a more elaborate decoration of medieval tiles appears in the 13 th century. Developed by Cistercian monks, the technique of inlaid decoration is widely used in northern Europe, mainly in France and England. 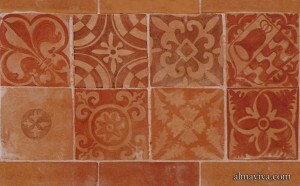 A wood matrix on which is carved a pattern is pressed onto the red unbaked clay. The imprint left hollow is filled with diluted white clay called engobe. Once dry, the surface is leveled and the motif comes out very clear thanks to the contrast of colours: a yellow motif on a red background. Thereafter, the tile is covered with a lead transparent glaze. Religious orders, rather austere, imposed geometric patterns. As the demand increased, drawings became more elaborate: images of angels or saints, lilies, coats of arms, stylized figures of animals, monsters, scenes of popular life, etc. Under the influence of the Moors of Spain, tiles began to ornate not only floors but also walls. In this case, the robustness of the decoration is no longer necessary, and the technique of inlaid is then replaced by a decor simply painted with a white engobe, under a transparent glaze. By the end of the Middle Ages, in Italy and Spain, a new decorating technique appears. The tiles are covered with an opaque white tin-glaze on which the decoration is directly painted: plants, rosettes, animals, or human faces announcing the early Renaissance. 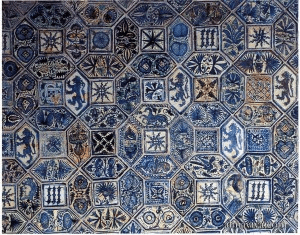 These blue and white tiles are produced in large numbers in the 15 th century in two villages near Valencia in Spain: Manises and Paterna. There are known there as azulejos or rajoles. 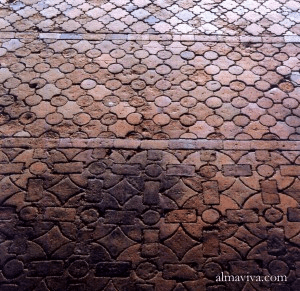 Decorated tiles are often alternated with plain terracotta tiles to decorate floors and walls: the Palais des Papes in Avignon provides a good example of this type of medieval floorings. In some case oblong hexagonal tiles are combined with square tiles to form octagons.